Water, water everywhere — and not a bad day in sight. Welcome to the remote reaches of the earth, where your beloved is more stunning than a coral reef and more adorable than a sleepy koala. What's to Love: There's no such thing as half measures when you're about as far south as you can go before hitting Antarctica. The hotel design is dramatic and impressive: Suites sweep out from the open-plan common area in a descending crescent shape, framed by a private beach on one end and a cliffside walk on the other. There's nothing but nature wherever you look, whether out to sea from your unobstructed balcony or at the surrounding greenery on your leisurely walks. (Keep your eyes peeled for wallabes in the brush.) The food is local and amazing, and you'll want to smuggle the sheep's cheese in your mini-bar back home. When you manage to tear yourself away to explore the natural wonders throughout the island, SOL's knowledgeable guides (like Phil, the @) will tell you everything you need to know about the sea lions, kangaroos, koalas, and raptors who outnumber people down here. What's to Love: The Great Barrier Reef's most luxurious hotel is on Hamilton Island's secluded northern tip. Enter through a giant Jurassic Park-like gate surrounded by tropical flowers and fragrant eucalyptus trees. Guests are greeted with Champagne and keys to their own golf buggy. Children below the age of sixteen are not welcome. This is the place to sneak off to for romance and privacy. Book a Winward Pavillion for their private plunge pools overlooking the Coral Sea. Uluru awaits. Photo courtesy of Longitude 131. 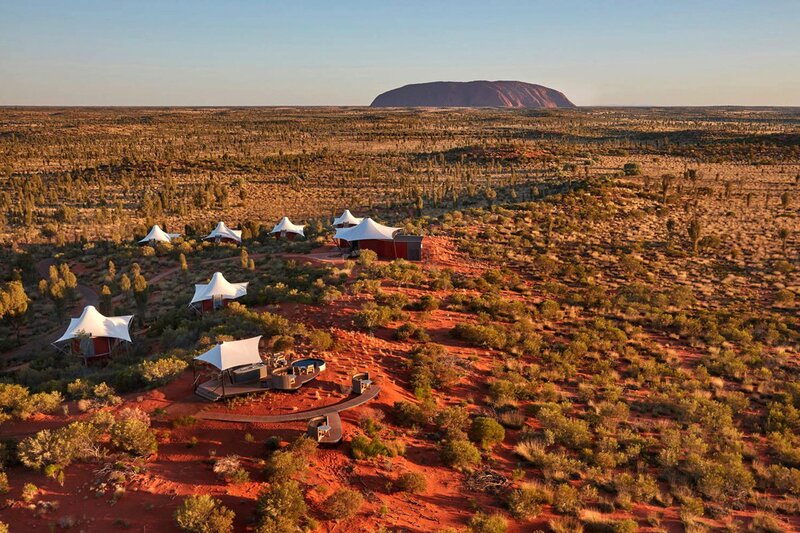 What's to Love: The hotel the only place where you can sit under the stars and look directly at Uluru (Ayers Rock), one of two World Heritage-listed natural icons, along with Kata Tjuta (The Olgas), in this stunning and spiritual setting. Go soon for two reasons: After October 2019, visitors will no longer be permitted to climb to the top of Uluru. (Because this is sacred Aboriginal land, it's considered disrespectful.) But the twinkling installation at the base of the rock, Field of Light by British artist Bruce Munro, which looks as if someone flipped the night sky onto the ground, has recently been extended for a few more years. Longitude may be tented wilderness camp, but it's one of the Luxury Resorts of Australia and recently had a multi-million-dollar revamp. Roughing it, you're not, mate. What's to Love: Don't go here with anyone you wouldn't like, because it's the most romantic place ever. There's nothing to do but spend time with the person you're with. Good to Know: The five-star property is located on a little islet, accessible by boat, and is a quick, gorgeous helicopter ride to Bora Bora. What's to Love: This sandy spit of land has romantic over-water bungalows and perfect views of Bora Bora's iconic Mount Otemanu. Evening starts on the cliffside patio specifically made for viewing the sunset and ends with dinner on the beach, complete with French Polynesian dancers welcoming you ashore. Good to Know: Guests of Private Island have full access to all restaurants, pools, and amenities at the larger , just a few minutes away by boat. What's to Love: There's a private saltwater lagoon, swim-up bar, 13,000-foot spa, and coveted . Good to Know: The creme-de-la-creme is the , which has a chef's kitchen, tropical garden, and private hammam. What's to Love: Red Bull founder Dietrich Mateschitz decked out a lush, biodiverse private island with 25 villas set against volcanic mountains, coconut groves, and white-sand beaches. It's a South Pacific paradise of night-diving through coral reefs, meals in the rain forest of produce from the island's sustainable organic farm, and horseback rides on secluded clothing-optional sands. What's to Love: The remote island of pearl divers is the perfect place to reconnect with the person you are with. It's like a small Eden with amazing water bungalows. Узнайте про полезный блог на тематику xn--80aaahqpcuvhvipz6j.com.ua.